Well- it’s that time again- the beginning of a new month. So- here is a summary of what I wore in November! I apologize- I am lacking in creativity this week- not only in my titles (‘Cream Sweater’- come on, surely you can do better than that?) but also in my outfits.. I think I’m suffering from jet lag- or writer’s block- or maybe there’s just too much on my mind. Is anyone else a bit Christmas crazy at this time of year? Yesterday I made a spreadsheet of all that I need (or want) to do this time of year. And truth be told- getting it all down on paper (ahem, Excel) actually made me feel better. But back to my outfit, I’m wearing another tried and true one today. I am really into this look this fall/ winter (bet you figured that out already). I love the classic, polished look of a checked shirt peeking out under a cable knit sweater paired with skinny jeans and boots. It’s simple, stylish and totally me! Be careful though- your sweater should be fitted- not loose and baggy like the look on the right. I also prefer the dark skinny jeans as opposed as the loose boyfriend style on the right (I love this style, but these are a just a little off). I want to be cute and comfy today (I think I say that every day!). So I decided to go with my cream stretchy cords. They are so soft and so warm, perfect for a cold winter day. I love pairing black and cream together- it’s an easy, classic combination. My first look on the right I have on a large, baggy black top. It’s not doing much for me- too loose, too boring. On the left I have replaced it with this slimmer, long sleeve V neck black t shirt- and then to add warmth (and some style) I added my faux fur vest. To finish it off, I added a long pendant necklace that ties all the colors together. For my shoes I chose my desert booties. I can wear socks with these- so my feet are nice and toasty and the subtle color doesn’t distract from the rest of the outfit. Now, being that it is Three for Thursday, I’ve decided to show you some other ways I’ve worn this faux fur vest. It’s a fun piece to have in your closet- a great little way to dress up an otherwise plain or boring outfit. Plus, it makes me so warm! November 28, 2012 by Megan2 Comments on Nov 28th, You Again? I know, I’ve worn this dress so many times you all are probably sick of it. But, since I only show my own clothes from my own closet you will have to bear with me as I wear one of my favorite dresses again! 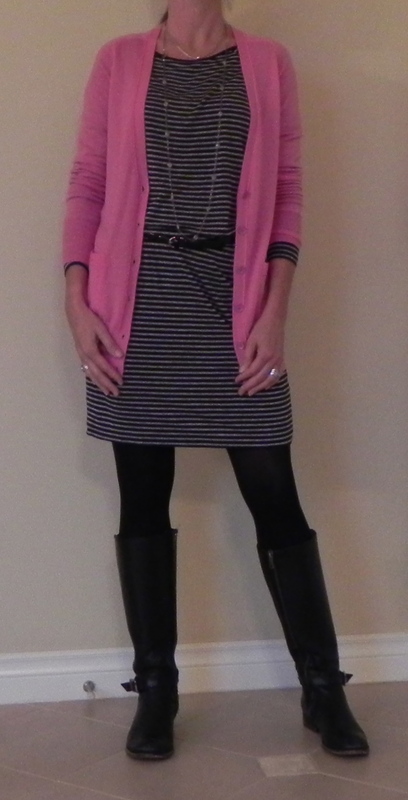 This time I decided I needed to add a little color so I paired it with a bright pink cardigan, black tights and black boots. I originally thought I’d skip the tights, but the dress looks too short with just my bare legs (I think I might have shrunk it on accident! Darn it!). Since the dress is so short, adding the tights (or leggings) makes it more appropriate for work. Let me share with you a little lesson I have learned here- when you are out shopping, if you find a great, versatile day dress- buy it! You will be amazed at how many different ways you can wear it- and it’s so nice to have a ‘go to’ day dress in my closet! Look for something somewhat neutral- so that you can change the look of it easily. A bold print is great- but not nearly as versatile. Don’t let the price scare you off, this dress was well over $150, but for the amount of times I’ve worn it- it has paid off. Another great hint is that I have found fabulous dresses at TJ Maxx and Marshalls- so go check them out! Just be very critical in your decision making- just because something is a great deal- doesn’t mean it’s great. Also, just because something is ‘designer’ doesn’t mean it is fabulous for your personal style. I bought a Calvin Klein maxi dress at TJ Maxx that looks like a nightgown (as seen here). Big mistake- even if it was only $39… I would suggest having something pretty specific in mind when shopping, so you don’t end up with an impulse purchase you will regret. After a wonderful vacation, I am now home and have to get back to work. Lucky for me, jeans are appropriate in my office, but I still want to look professional, so I like to add a blazer. As you can probably tell (if you are a regular reader), I am a huge fan of blazers. I used to love cardigans and twin sets (yes, I am that old), so a blazer is a great alternative to that look. The thing to be careful of with blazers is to not look too serious or too dated. So, if you have a bunch of old blazers lurking in the back of your closet- you might want to check a few things before wearing it. Are there large shoulder pads? Is the cut fitted (does it nip in at the waist or is it a boxy cut), is the length too long (aim for the waist). Today I am wearing one of my old blazers. I bought this a few years ago at Ann Taylor- and while I love the color (it is especially popular this season), I had to cut out the shoulder pads and roll the sleeves to keep the look modern and current. I also decided to replace the stiff, formal button up white shirt with a black and gray striped t shirt. I added a black bracelet and necklace to finish the look off. I have paired the blazer with my boot cut jeans. This is another common question I get from readers- asking how to wear boot cut jeans. Lot’s of women prefer this style to the skinny jeans- and I understand. They are a lot more forgiving for any figure flaws! I like to pair them with something slim and fitted on top and definitely with heels! Wedges are a great option. I must take a minute to apologize to anyone who’s feelings I hurt by posting the photo of the tie die family and the lady with the socks. I meant no harm! In defense, this is a style blog- and in my opinion- those items really aren’t very stylish. But- as many readers pointed out- in Disneyworld anything goes- and dressing alike in huge crowds can be a great way to keep a group together. Today’s post is actually from Universal Studios, not Disneyworld! Again, I’ve gone with comfort, warmth and layering! I’m wearing my cropped skinny J Crew jeans, a white tank (which you can’t see), my polka dot top and a gray cardigan. I’ve chosen my Dansko sandals again- and again I must sing their praises! These shoes are awesome! I will admit, looking at the picture, they aren’t super stylish, but for the sake of having comfortable footwear, I don’t care! In my hand is my 2nd glass of Butterbeer, from Harry Potter world. If you’re planning a trip to Universal, I highly recommend trying some (get the frozen kind- and don’t wait in line to get it, go into a pub). Three for Thursday is perfect when you are on vacation. It’s great to be able to pack one staple item and get several different looks out of it. Not my favorite look- but since I’m working out of a suitcase, tying my denim shirt over the top of the dress also gives it a fresh look. A simple, cotton dress is a great item for your wardrobe- especially when on vacation. As you can see- there are so many options and your look can easily be changed with a few simple changes. In case you didn’t see my outfit from the other day- here is a 4th way to wear it! Since it’s Thanksgiving, I think it’s appropriate to share what I am thankful for- and without trying to sound cheesy- I am incredibly grateful for my health. I have come to realize that being healthy is truly a gift, and I am so grateful for that- and that my family is healthy. Thank you God for that blessing. May I never take it for granted.